Give yourself a daily reminder of what rights are at stake with this disappearing civil liberties mug. Think your right to be secure in your person, house, papers, and effects is safe? Think again! Still got the right to assemble and protest? Not for long. This mug is a daily reminder of all those government figures hacking away at our Bill of Rights. When hot liquid is poured into it, some rights stay and others disintegrate before your eyes. Say goodbye to a speedy and public trial, but your right to bear arms is perfectly safe. The makers of this snarky sipper were inspired by Greek philosopher Thales, who asked fundamental questions about the world. Thales was also one of the few philosophers in history to make money by predicting a prosperous olive season. In the same vein, this mug turns philosophy into something you can actually use. Designed in Brooklyn, New York. Made in China. I thought it was a great gift, and a good size to the cup. I thought that it was something that would be used often. Looks to be of great quality. It turns out this is not dishwasher or microwave safe. So not really a "practical" gift. You have to hand wash without harsh soap so I don't think my dad will be using this very often! Well received gift. Would recommend. Hand wash minor inconvenience. With the current political climate, I believe my friend will give an ironic chuckle or two as the words on the mug disappear. Bought this as a gift for a friend of mine recovering from surgery and she absolutely LOVES it! My son gave this to his Dad who is an attorney. Very unique gift! The amendments really do disappear when you add hot water to the mug! Perfect Gift For My Politically Minded Grandson! 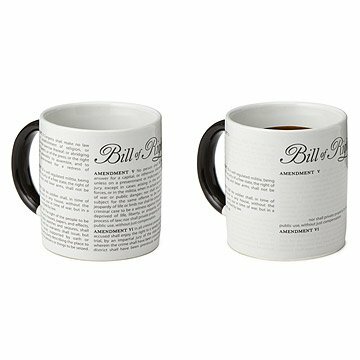 It is a perfect gift for a "thinking" young man BUT ..... it works by putting heated liquid in the mug - and Alex is not a coffee or tea drinker! I'm suggesting he use it for cups of hot soup!